This recipe is the property of Queuetue and released under the CC Attribution-Noncommercial 4.0 license. You may not copy, derive or commercialize this recipe without following the terms of this license or the explicit permission of the creator. It's been a couple of months now and while this is an interesting recipe, the Anise just isn't steeping out enough for me to love it. I think I might be overly sensitive to the stuff, but I wouldn't recommend this to someone who has tried recipes with that flavor before and never liked them. I mixed this up as well as v17, and I must say, that I am very impressed. I can't stand black licorice, I purchased Anise just to try this recipe as the described profile sounds just like my perfect vape. I wanted to try it just to see how well a flavor like that could be masked or redirected, as I am early in my mixing journey. I let this sit for 10 days before I tried it. I am getting a slight anise taste from both mixes at two weeks, but I can tell it's fading and blending as more time goes by. I feel like this juice will benefit from a nice month long steep. I can't wait to try it once it's steeped for a couple more weeks, as it gets better and better each time I try it with less anise noticeable as you say In your video. 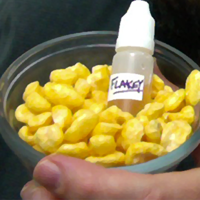 How does the flavor develope as time goes I saw you had some year old flakey?